Solo: A Star Wars Story unveiled its second (and most likely final) trailer tonight during American Idol. We open on an industrial city with Star Destroyers being constructed in the sky. This is most likely Corellia, Han's homeworld. 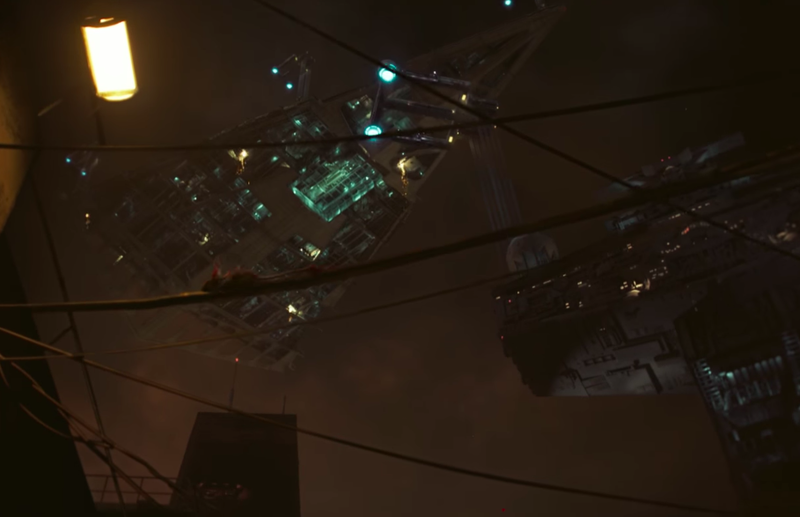 Rogue One had similar imagery of a Destroyer looming over Jedha, but it's not as threatening a presence this time. Corellia isn't resisting Imperial rule; they're making a business out of it by building their massive warships. "Money?" Qi'ra continues. 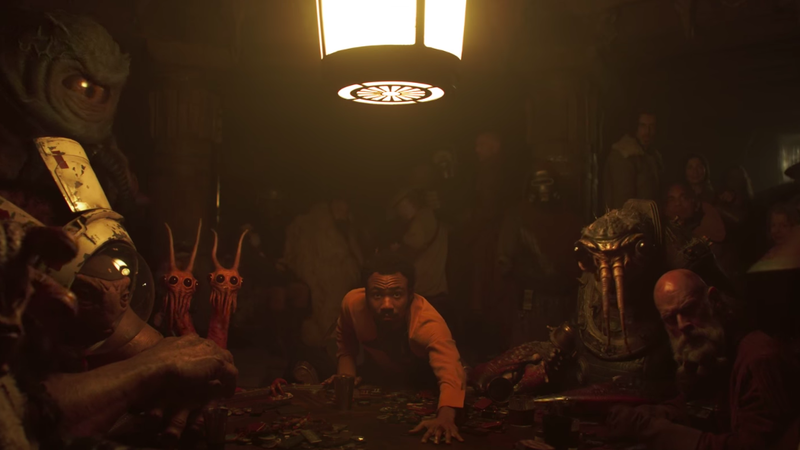 Han swaggers into a gambling den, where Lando Calrissian and various assorted aliens take notice. Han pushes a pile of coins forward. This, of course, is probably the legendary game of Sabacc that wins Han the Millennium Falcon from Lando. "Or is it something else?" Qi'ra muses. Han and Chewbacca examine the Falcon. What he's looking for is an adventure, a reputation, a legendary name. Solo, at its very core, is the story of how he gets that. "You look good. 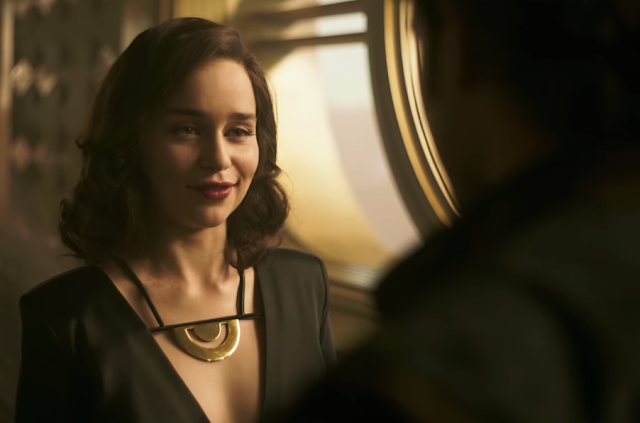 A little rough around the edges, but good," Qi'ra tells him in a fancy club. 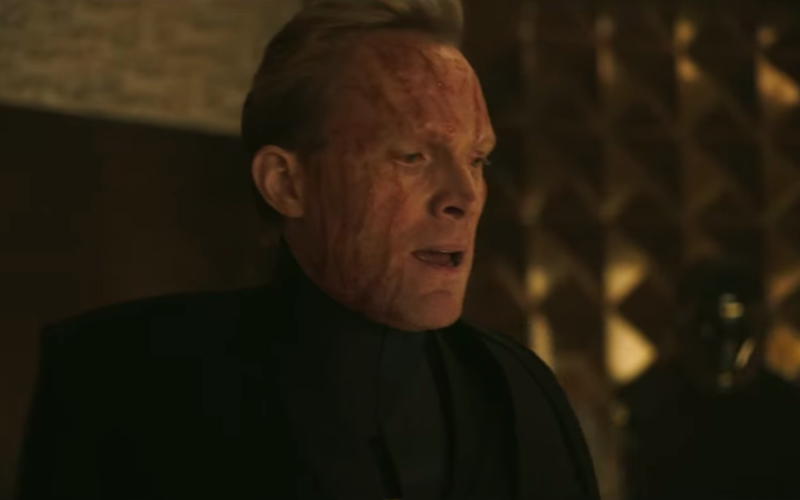 They were old friends (and perhaps more) on Corellia, but it seems like it's been a few years since they've seen each other. Qi'ra looks like she joined the galaxy's high society, while Han...maybe got a new jacket? "I heard about a job. Big shot gangster putting together a crew," Tobias Beckett says. We see Dryden Vos in the same club. This is our first look at Paul Bettany's character, who was originally supposed to be played by Michael Kenneth Williams. He seems to be the man who organizes this gang, though he won't be joining them on the mission itself. "I'm a driver and I'm a flyer," Han tells an Imperial officer. He looks to be wearing a mudtrooper disguise on the swampy planet of Mimban, where we know an action sequence will take place. "I waited a long time for a shot like this," Han tells Val next to a campfire. She inspects a rifle. Beckett kisses a blaster pistol and tosses it to Han. 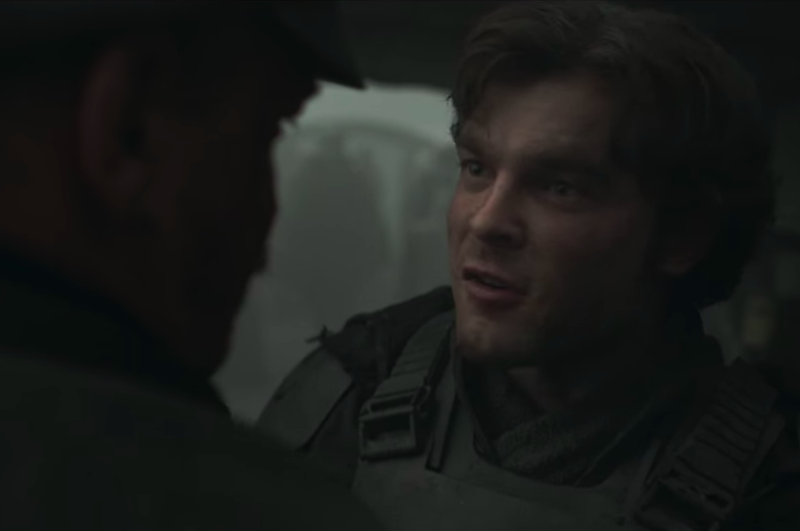 EW told us that Val's skeptical of Han at first, so he must be reassuring her that he's committed to their mission. "What do you think?" Han asks Chewie, who growls with a worried tone and shakes his head. "Well, what do you know," Han dismisses him. Poor, poor Chewie. Han's the only one who can understand him (he took Wookiee classes at school? ), and he still won't listen to any of his ideas. It's okay, Chewie, we all know you'll outlive him. "You got a line on a ship?" Beckett asks. "Yeah, I know a guy. 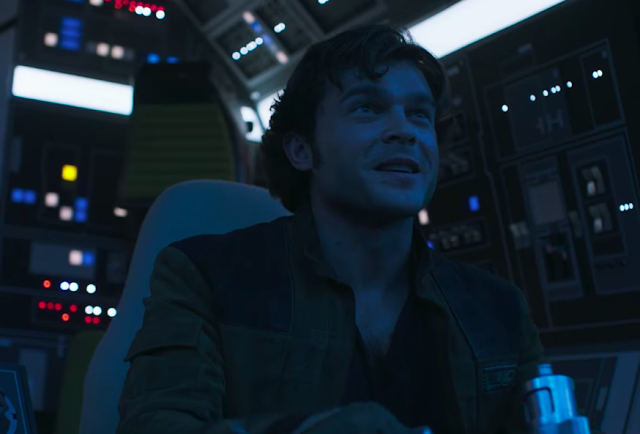 He's the best smuggler around," Qi'ra says. 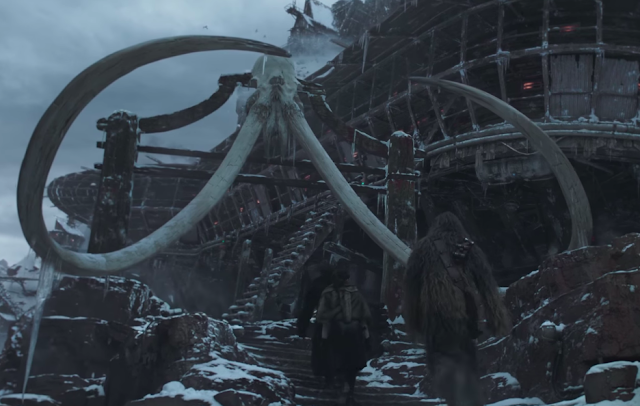 Han, Chewie, and Qi'ra walk into a cantina in a snowy terrain. 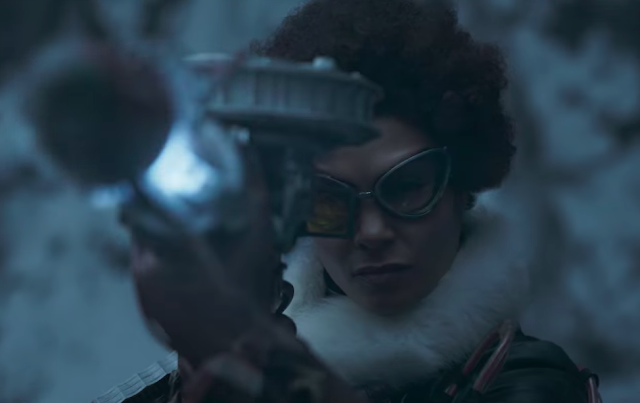 So Qi'ra is the one who first introduces Han and Lando. 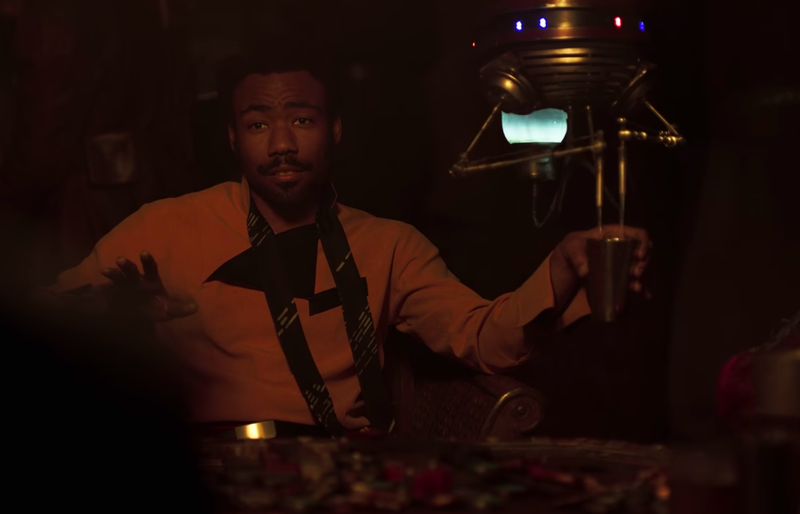 It looks like the meeting with Lando, the campfire scene, and the train heist (more on that later) are all on the same planet. "I heard a story about you, I was wondering if it's true," Han asks Lando across the table. 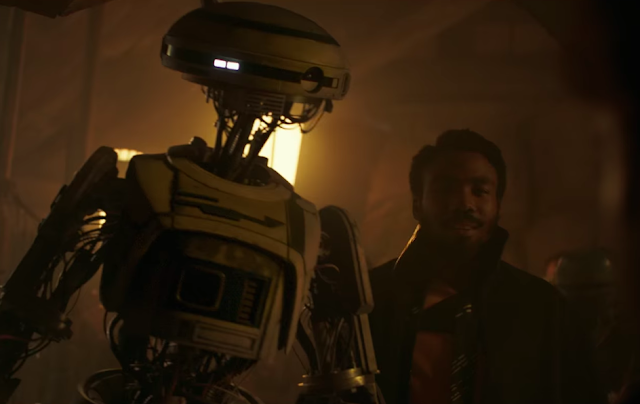 "Everything you heard about me is true," Lando assures him as a droid refills his cup. 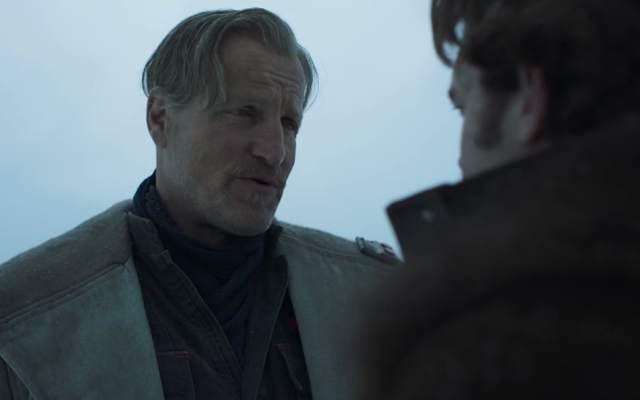 There's a parallel here between Han's famous line from The Force Awakens: "It's true, all of it." As the best smuggler in the galaxy with the ego to match it, Lando is everything Han wants to be—and will be. L3-37 shoves a man in the head. "Let go of the mean man's face," Lando tells her. "Who are these guys?" she asks as she regards Han, Chewie, and Qi'ra. 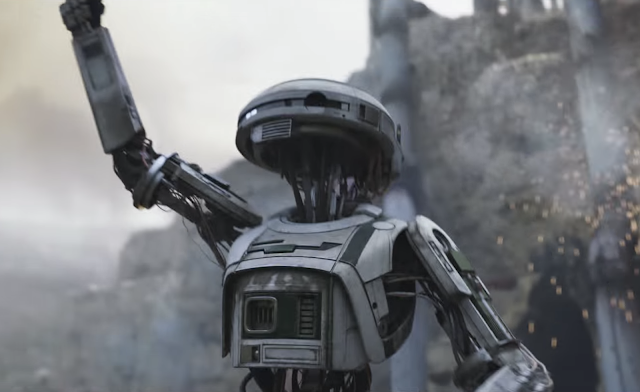 It seems like she has the maturity and temper of a child, which is fascinating to see in a droid, much less a female one. "If you come with us, you're in this life for good," Beckett says to Han. "Might wanna buckle up baby," Lando tells him in the Falcon's cockpit before jumping to hyperspace. Well, Beckett's not totally right, since we know Han eventually escapes this life and joins the Rebel Alliance. 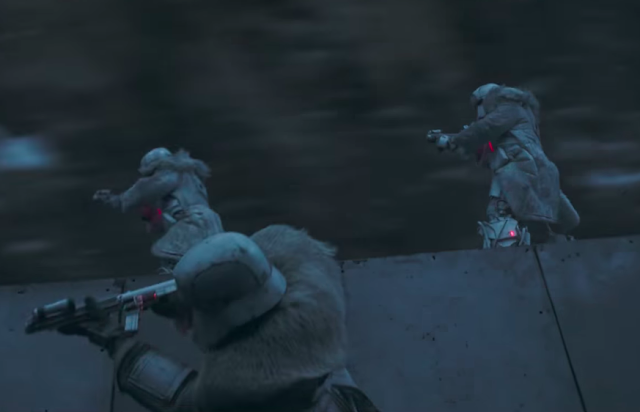 Range troopers with magnetic boots shoot at Beckett atop a train. He blasts one of them in the chest. We've seen train heists in movies before, but this one looks especially creative. Freezing temperatures, dizzying heights, hostile range troopers, and we know Nest and the Cloud-Riders have a role in this sequence, too. "Let me give you some advice: assume everyone will betray you, and you will never be disappointed," Beckett tells Han. We get quick shots of Lando raising a blaster, Qi'ra exiting the Falcon, an Imperial walker dropping on Mimban, and Val firing a grappling hook in the same snowy terrain. 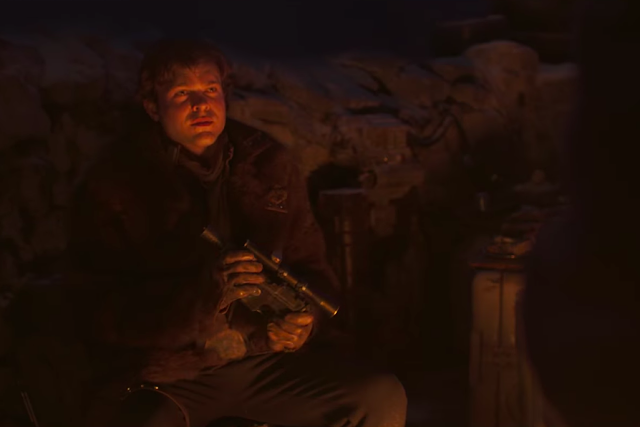 Lando has a history of betraying Han and Qi'ra might be the villain of the whole movie. But hey, at least he can count on Chewie. 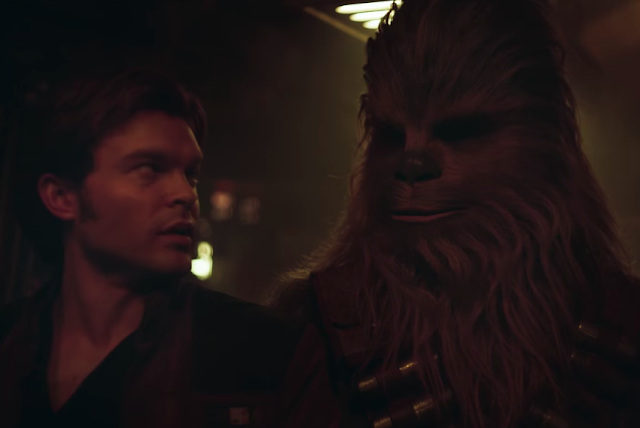 Chewie has an intimate moment with another Wookiee as lasers whiz by the Falcon. Whoa! 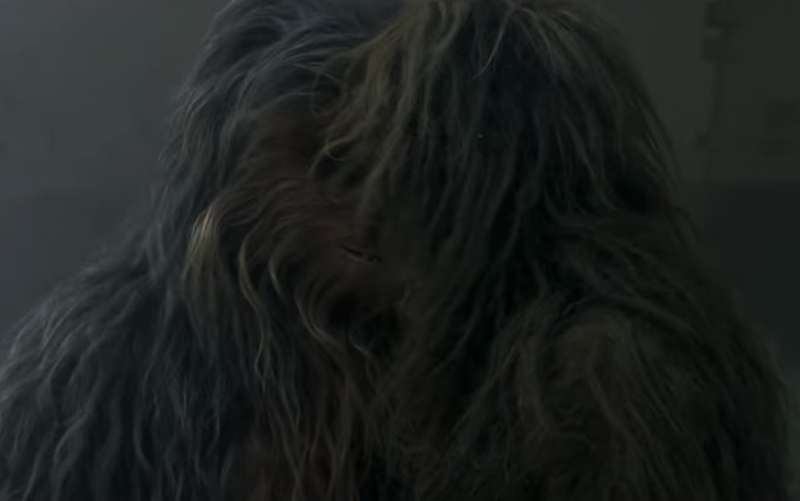 The only other time we've seen Chewie on-screen with other Wookiees was Revenge of the Sith. This is either his wife, Malla, or his son, Lumpawaroo, both of whom are canonically separated from him around this time period. But guys, you're in the middle of war zone...maybe not the best time for tender goodbyes? TIE fighters chase off the Falcon. Chewie flips a few switches. "Since when do you know how to fly?" Han asks. Chewie growls in response. "190 years old? You look great!" Han says. "Punch it!" 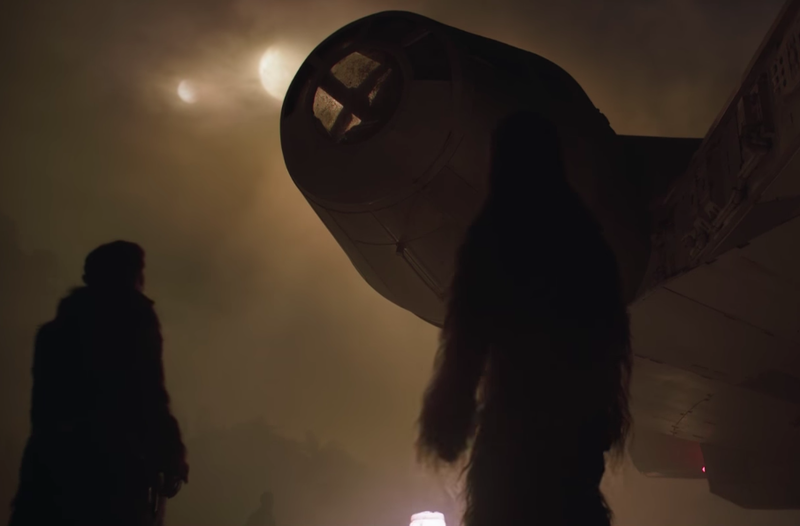 Conveniently, this confirms that the majority of Solo takes place in 10 BBY (10 years before A New Hope), since Chewie was canonically born in 200 BBY. That would put Han at 19 years old. The Falcon soars over the sandy outpost. Vos activates vibroblade brass knuckles and lunges at Han in the club. 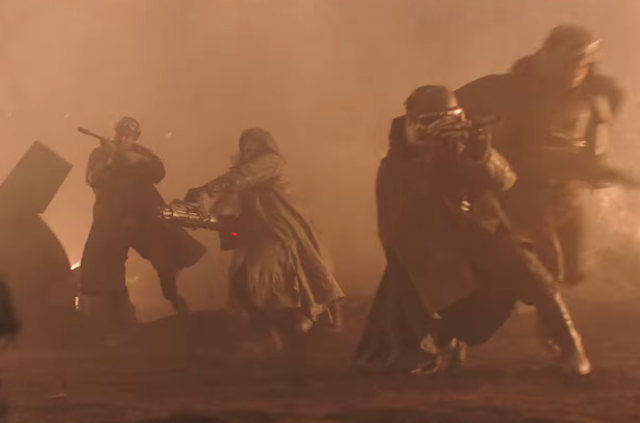 Shots of a huge firefight on Mimban, Chewie throwing someone to the floor, and Qi'ra tossing a grenade. Action! Explosions! Other than the shot of Vos (which indicates he and Han will part ways), this is just kinda typical action movie content. But at least it looks pretty damn cool! 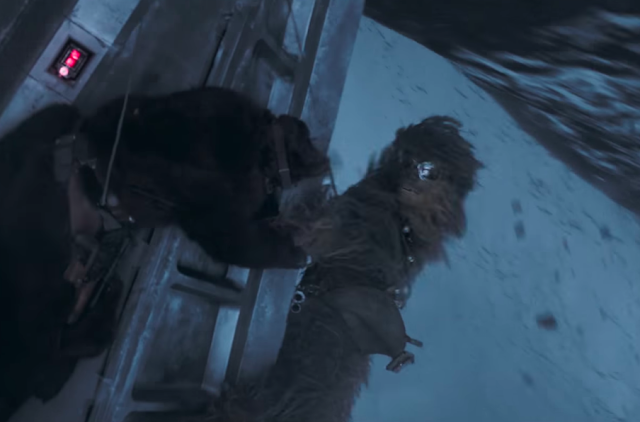 Chewie tumbles over the side of the train. Han hangs on to him, but a protruding chunks of rock appears in his path. 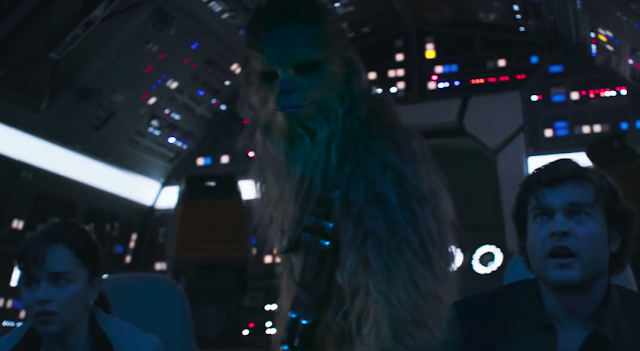 Nice try, trailer, but we all know Chewie's gonna live. Like, we just saw him in The Last Jedi a few months ago, and he survived that movie without a scratch, too. 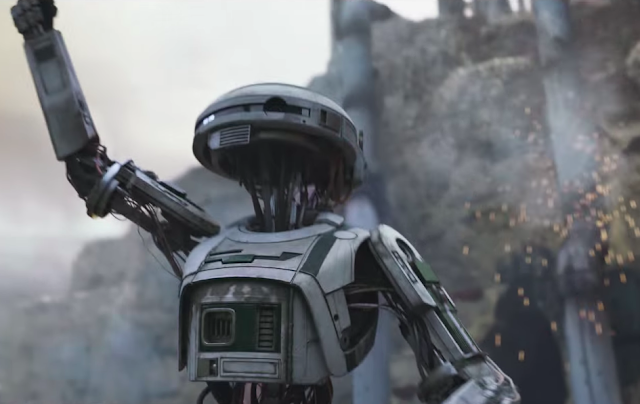 At least when Lucasfilm teased that kind of major-character-death in the Rogue One trailers, they were able to deliver on it. Consistency is always a good quality in a movie's marketing, and it's reassuring that this trailer matches the first one in tone. Again, it's a diverse, fun cast of outlaws on a heist mission, with a fair amount of humor mixed in. The only real change here is the whole "Who can you trust?" 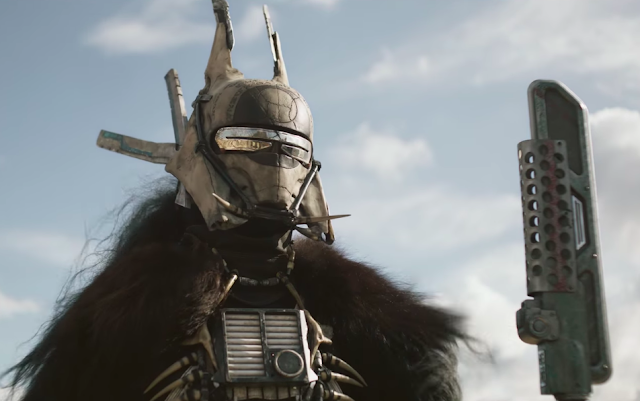 marketing ploy, which isn't really something we've seen from a Star Wars movie before. The film's theatrical poster was also released tonight. 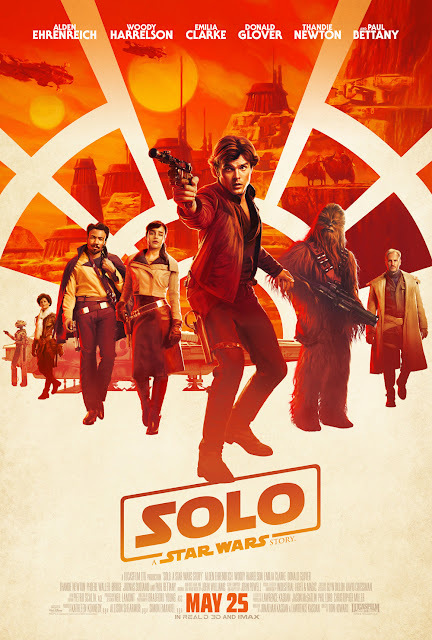 Unlike the typical Drew Struzan-type Star Wars posters, with many characters and vehicles cluttered around, this one is a simple lineup of the film's main characters (mostly using bits from poster and promo art we've seen before) with the pattern of the Falcon's cockpit behind them. What did you think of this trailer? Which character are you looking forward to the most? Tell me in the comments or tweet to @sithobserver, and may the Force be with you all.